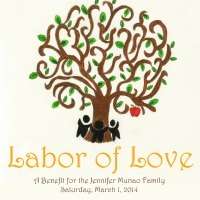 Please join us for an evening supporting Jennifer Munao and her family. The Labor of Love benefit will be held on Saturday, March 1, 2014 at the Marriott O’Hare from 7:00 to 11:00 pm. The event this year will feature live music, buffet dinner & desserts, premium open bar, various raffles and both live and silent auctions. Cocktail Attire is suggested. Ticket prices are: $100 per person at the door. Online registration is no longer be available. We will take credit card, cash or checks written to the Park Ridge Newcomers Club.